In the modern world, cast iron seems in some danger of being too commonly overlooked, perhaps seen as an "old-fashioned" novelty or specialty sort of cookware. It is not. About the only things that don't cook best of all on or in cast iron are those where the cooking process requires a rapid change of temperature. Cast iron is the original (and still the best) "non-stick" cookware: a properly seasoned piece of cast iron cookware is silken smooth, and everything from pancakes to flatbreads cooks wonderful well—and easily—on it. Having easily reached that conclusion, we are now retailing Lodge cookware on this site. As with actual induction-cooking equipment, we believe we have the lowest prices to be found on the web, and we invite you to look over (and, we hope, select from) the entire Lodge line of cast-iron and enamelled cookware. We get asked a lot about using cast-iron cooking vessels on the ceramic-glass surface that all induction-cooking units use: does it scratch? Can one cook using "pan-slide" techniques without scratching the surface? Lodge cautions that their non-enamel cast-iron cookware (and this would likely apply to all cast-iron cookware except, of course, enamelled cast iron) might cause scratching, as the bottom of a cast-iron piece is naturally rougher or grittier than, say, stainless steel, and anecdotal evidence strongly supports the realistic possibility of such scratching. But . . . this is induction—no flames! We thus need to think outside the box. If you have a cast-iron skillet and want to cook something using the pan-slide method, just put a sheet of some heat-resistant (and non-metallic) substance under it. The obvious choice is parchment paper; though one maker (Reynolds) says it can be used "at temperatures up to 420°F", Cook's Illustrated refers to its being "enormously resistant to high temperatures"; many widely published recipes using parchment paper call for baking at 450°F and we've even seen pizza recipes calling for parchment paper in an over at 500°F to 550°F. All in all, it seems unlikely that the temperature of a skillet bottom would be a problem for parchment paper (and its silicon coating makes it slick and so, presumably, easy to slide a pan on). While we haven't yet had opportunity to test it ourselves, we feel confident it would work fine in this use. Parchment paper is relatively inexpensive—only a tad more than ordinary waxed paper—and universally available (and is a handy thing to have in a kitchen anyway); Cook's likes the Reynolds brand. When we first began work on this page, we started making a list of known induction-ready clad cookware lines—but we quickly abandoned that effort, because the list was becoming comically and tediously long, yet would obviously still be far from all-inclusive. We instead decided to go at it the other way round: identify excellent cookware, then see what's induction-ready. That still did not make the task simple. The world is full of cookware of undoubted excellence, and to abstract from that fullness a few particular brands necessarily requires some harsh and perhaps arbitrary chopping. We're not in a position to ourselves relentlessly test brand after brand of cookware, so we necessarily have to rely on what other say; that, in turn, requires not only extensive reading, but also the judging of the probable expertise or reliability of the sources being consulted. Here are some of the places we looked, and what they had to say. One useful resource, Consumer Search's Cookware review, does just what we were engaged in doing, "meta-reviewing": it's a review of cookware reviews, so to speak. You can (and should) check their material for yourself, but two things emerged clearly from it: the overwhelming majority of review sources went for stainless-steel cookware, and of stainless, the runaway preference was the All-Clad Stainless Steel Uncoated cookware line. There are less-expensive alternatives discussed, but as the review says "[P]rofessional chefs, expert cookware reviewers and amateur foodies agree that you should always have the best tools you can afford. So, if you can afford All-Clad, you should get it and then pass it along to your children." In December of 2005, the Consumer's Union organ Consumer Reports published its take on cookware (available on line only to paying members). Their methods and criteria may not match those of expert cooks, as they address the general consumer market, nor did they include every line of even just the better-known cookware names (some of which are "well known" only in narrower culinary fields). Their winner for uncoated cookware was the Kitchenaid Gourmet Essentials line. All-Clad was a ways down their list, though the separation between brands, even top to bottom, doesn't look vast (they use little bars to signify). Calphalon Contemporary, another popular line, was their runner-up to the Kitchenaid; that is interesting, because Cook's Illustrated found Calphalon less than satisfactory (see the Consumer Search metareview linked just above). So the significant discrepancies between Consumer Reports and most cooking-specialist reviews seems to cast some doubt on the utility of a general-purpose consumer magazine for reviewing specialty items. But you can read it for yourself (if you subscribe). Another source is an AP article Cookware 101: the essentials [archived copy], which discusses the types of items, but not much about brands; perhaps the most notable sentence in it is one germane to the paragraph above: But Consumer Reports' findings don't jibe with those who spend their days in the kitchen. Take it for what you feel it's worth, but that does seem to be expert consensus. The classic Cook's Illustrated list, A Guide to Essential Cookware, set forth different cookware makers for their recommended basic "set", item by item; their stainless choices were each from All-Clad, the exceptions being the stockpot and the non-stick sauté pan. Interestingly, for a stockpot they recommended the cheapest thing not actually trash that you could find, inasmuch as all they recommend using it for is boiling large amounts of water, as for pasta; for true stock-making, they prefer a Dutch (aka French) oven—and we think that is indeed a sound idea. Our own conclusions, after reviewing those sources—and quite a number of others—is that when push comes to shove, All-Clad is the winner. It's not so much that this or that more or less qualified authority praises it, it's the cumulative weight of one after another after another after another, all in glowing superlatives. It's not so much that nothing else is really any good—as we said, there's lots of good cookware—it's that apparently nothing else is quite this good. All-Clad is not inexpensive. (Though as one cooking-school chef said, When it came time to upgrade from the Calphalon Commercial Nonstick set that I have at home, I considered All-Clad, Mauviel Professional and Demeyere Sirocco. I chose All-Clad because it is good and inexpensive compared to other cookware in its class. [emphasis added] You don't always get what you pay for, but you never get what you don't pay for. If your idea of cookery is centered on microwaves and Hamburger Helper, you don't need or want All-Clad; if you take cooking in the least seriously, then consider that you're buying cookware that you can, with only modest care, pass down to your descendants. What is its cost when amortized over its useful lifetime? Not a major factor. And no one says you have to buy every scrap of cookware you'll ever want all in one swoop—if budget is a consideration, add pieces over time, making do with whatever (though Lodge cast-iron is awfully good "whatever") till you can get The Real Thing. Indeed, we—along with most sources we checked—recommend that you stay away from "sets", in which you too often get items you don't very much need or want—and stick to building your enduring cookware collection item by item, as budget allows and need suggests. And, again, keep in mind that cast iron, which is pretty inexpensive, can be the backbone of a good collection. 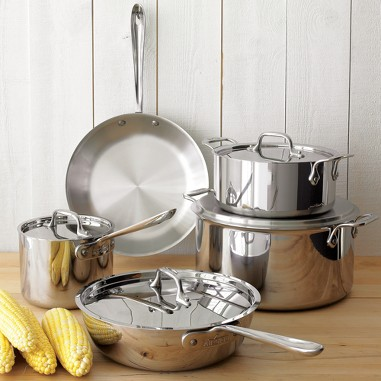 Having reached that conclusion, we are now retailing the All-Clad "Stainless" cookware line on this site. As with actual induction-cooking equipment, we believe we have the lowest prices to be found on the web, and we invite you to look over (and, we hope, select from) the All-Clad induction-ready lines of stainless-steel cookware (three: the classic "Stainless", and now the "d5", and "Copper Core" lines). This sort of cookware is generally known as "graniteware" (though also sometimes as "agateware"), and it dates back almost two centuries. It is generally similar to enamelware (and indeed could be considered a subset of enamelware), but nowadays the coating is applied over steel rather than cast iron. The name comes from the distinctive white-mottled appearance (see the image at the right), which gives the look of granite (or, in some eyes, agate). 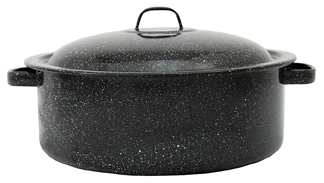 Graniteware can, in principle, come in any color, but to get yellow, red, and certain other bright colors it is common to use cadmium, which is potentially hazardous to at least the workers who make the goods; that is why most graniteware is blue or black (with, again, that characteristic white mottling). Graniteware is today made chiefly (or wholly?) by one company, Columbian Home Products. The product line is well suited for use on induction: the core is 98% iron, while the porcelain (or glass) surface is fused to the steel at 1800 degrees; that surface is inert so it won't interact with or change the flavor of food, and the exterior is glass-smooth so it won't scratch the glass top of the induction cooktop as raw cast iron might. Full disclosure: we were sent test samples of a few items of CHS Graniteware. The CHS Graniteware line is chiefly pots and pans, though it also includes stockpots, steamers, double boilers, home canners, and other special-purpose cookware; if you follow the link in the paragraph above, you can see it all on the maker's web site. We expect that we will soon be adding in to our lists of cookware we sell. We want to emphasize again that, as with induction equipment itself, we do not list items just to list them, nor do we seek out the partners who would offer us the highest commission rates or net profit. We want to be here for the long run, so we simply will not list any item of anything if we do not believe we are offering it at as low a price as can be found, and from a reputable source that will stand behind the sale and the maker's warranties. Our perhaps old-fashioned belief is that if you deal fairly with people, they will come back and shop with you again. And we're certain that if you don't treat them fairly, they will never return. This page was last modified on Sunday, 18 June 2017, at 5:58 pm Pacific Time.